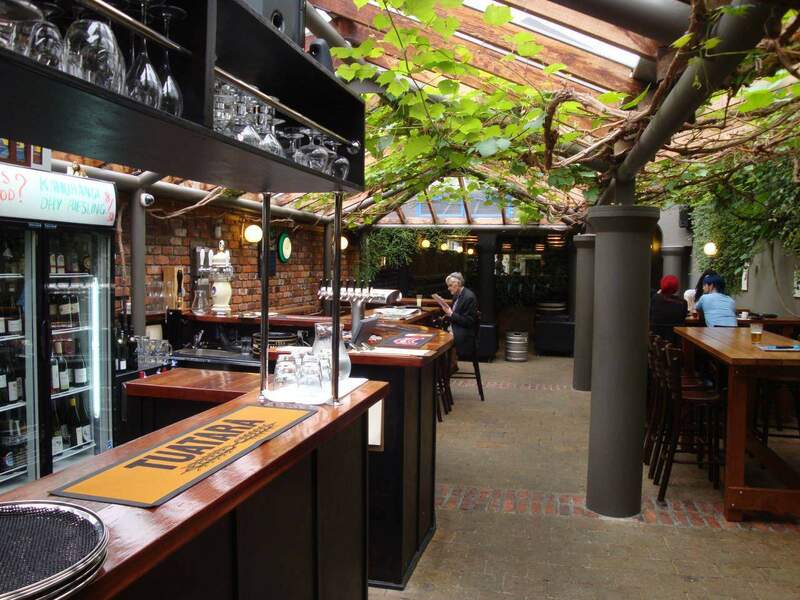 The garden bar is a staple bar for any Wellingtonian craft beer aficionado. For a cheap eat, check out $20 pork roasts on Sundays. I like Hop Garden. Sure, it’s a little bit out of the way of the general Courtenay Place and Cuba Street bustle, but the relaxed craft beer garden bar still pulls a healthy and dense crowd over the weekends – thanks to its affable staff, beautiful interior and delicious selection of craft beers on tap. I went over for a lunch time affair, and tried a a delightful little Panhead Port Road Pilsner ($6) and a haloumi & rosti stack ($18), which comes with mushrooms, spinach, capsicum, tomato salsa. The stack was wholesome and filling, while the beer was sensational. Refreshingly hoppy and served blissfully cold, the pilsner was the perfect afternoon companion. With exposed brick walls, wooden tables and vines overhead Hop Garden has a certain rustic charm to it. The general Hop Garden vibe was definitely of a relaxed persuasion, with a few business suit-wearing males lounging in various corners, enjoying their business-expense meals – juicy-looking beef burgers and beers. I am told by the helpful barman that the Hop Garden picks up its game after sunset, getting pretty packed from about 8pm onwards. So whether you’re after a languorous afternoon or something a little bit more lively, the Hop Garden caters to both your needs. All in all, with its rustic charm, ten/ten beer and great atmosphere, the garden bar should be a craft beer aficionado’s staple stomping ground.